Are you smarter than an 8th grader in 1912? This school test was recently found and donated to a small county musuem in Kentucky. Can you answer these questions correctly? Today we heard from both teachers and students. Teachers shared lessons they have planned using the All Stars website and all the astronomers stories. 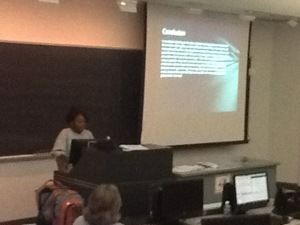 Students shared the research projects they have been working on. Both groups did a great job. I can’t wait to try some of the research projects myself and some of the lessons with my students. I have really enjoyed working with this group this summer. Today Sariaya did her presentation. She wanted to find out if all galaxies were the same so she asked if all the galaxies in our sample were the same color. Check out her blog to see her answer. I am looking forward to hearing the rest of the presentations next week. A lot going on today. Talks about the U of C College Bridge program and about applying to the college. The Bridge program is a wonderful program for students in CPS. What a great opportunity to be taking college course of U of C while still a high school student. You do have to do some planning though, if you want certain course as there are some requirements. Visit the website for more info. It was a lot of fun to watch students start asking questions about relationships between properties of stars and to watch them start grappling with the data. Looking forward to tomorrow. Interesting talk today on X-ray. I like learning about the history of telescope projects. It reminds me that learning takes time. Time to ask a question you can try to answer, time to build an instrument that can make a measurement that can help you answer your question, time to analyze the measurements and compare them to models. Our country has to be willing to be patient and wait for answers while funding the projects. Today we started our astronomy projects. First we have to get used to working with the SDSS interface. Everyone picked one of the Favorite Places to get a location in the sky. They then started looking for galaxies that had spectra and recording data. GRBs – Gamma ray bursts – thinking about these blasts of energy can really blow your mind. Just think, something happened to give off so much energy that we still a lot of it at earth, even after it has traveled billion of light years. It is always fun to see people contributing to science, especially when they are not scientists. Try the new Galaxy Zoo Quench. You classify galaxies but then also help in the analysis. There may also be dialog with scientists. Navigate The sky server at SDSS. An old Astronomy Picture of the Day (APOD) that show a diffraction spike and explains it rather simply. An article that talks about the diffraction pattern around bright stars seen in telescope images. How many plates were made for spectra? Are plates still being made today? How long are scientists able to keep their data private before making it public? Who came up with the idea of drilling holes for fiber optic cables? I was amazed at how many different projects Mr Woolf was involved in and how many places he has worked in. I’m confused on the interferometer he built at Lick Observatory. Was the Clark telescope connected to other telescopes? Doesn’t an interferometer mean connecting smaller telescopes? What do you mean by chemistry not being the exclusive way of continuing life? Back at U of C for astronomy!!! This time I am with many other teachers and students from Chicago for the Nasa All Stars Project. Even on the first day with introductions and paperwork I learned some new astronomy. My question today is – is there a correlation between a galaxy’s size and its distance? The Olympics have started. I love watching this competition. This year is even better as I have better television reception so I get more coverage. But the Olympics are not just about competition. There is a lot of science involved too. The science involved in some of these sports is fascinating. The website Science 360 has several short videos that showcase some very interesting applications of science in the Olympics. For the first time, a double amputee will be running in the Olympics. Watch the video about Oscar Pistorius to find out what his story is. This South African gold medalist in the Paralympics will be sprinting in the 400m and the 4×400 relay in this summer’s Olympics. Of course there is just a lot of fun at the Olympics too. Watching the homemade music video of the US Swim team performing “Call Me Maybe” reminds us that they are great athletes but also young adults having fun.